Split demo with 2 mexican punk bands both playing HC punk mixed with some ska and both very politically involved in social struggles. 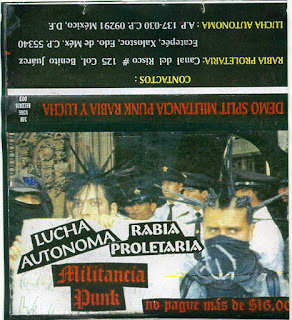 The cover sleeve reports an article about the anarcopunk movement.Good recordings although totally DIY and a colour sleeve finish this amazing split tape.It was released by the Jar Kore Records,a little totally diy label managed by the anarchist punk collective of Mexico City:Joventud Antiautoritaria Revolucionaria. Both bands seem to be still active.